Yay!! 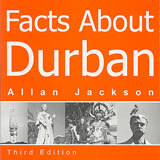 Facts About Durban is available again at only AUD22.00 per copy plus postage from on-demand printer Lulu.com. Ordering is as simple as going to our page on Lulu and adding one copy or 500 to the shopping cart. Lulu will then print and bind the copies you ordered and mail them to you.